The Fuji Z900EXR adds a 16-megapixel CMOS sensor and Multi-Touch functionality. Hot on the heels of its high-profile Fuji X100, Fujifilm has launched the FinePix Z900EXR compact camera. The Fuji Z900EXR features a new 16-megapixel EXR-CMOS sensor with a 5x optical zoom covering 28-140mm (35mm equivalent). What's more, the Z900EXR boasts a large 3.5in, 460,000-pixel LCD with Multi Touch functionality for checking the sharpness and clarity of images. With the Z900EXR you can use two fingers to expand and reduce image size, Fuji says, or swipe your finger from side-to-side to scroll through your pictures. Other key features include Full HD movie recording, which Fuji says is capable of filming in low light conditions with the FinePix Z900EXR's Pixel Fusion Movie technology where pixels are doubled up to make them more sensitive to low light. Fuji has also added a new EXR Auto mode with 27 different scene options. A Dynamic Range mode takes two pictures and combines them to provide a range of up to 1600%, Fuji claims. Among its other specs are an ISO range up to 6400, CMOS Shift Image Stabilisation and a 360° Panorama mode. 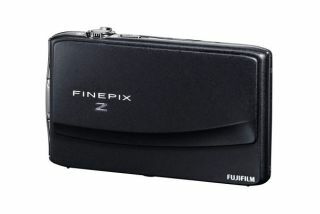 The Fuji Z900 EXR is available in Black, Gloss Red, Hot Pink and Royal Blue from the May 2011. The Fuji Z900EXR price tag will be £219.